From the Departments of Neurology (D.A.L., M.D.G. ), and Radiology and Medical Imaging (P.P.B., J.H.D. ), Charlottesville, VA; Department of Neurology (R.P.L. ), Wayne State University, Detroit, MI; Department of Neurology (E.I.M. ), Dell Medical School at the University of Texas at Austin; Department of Neurology (R.N.N. ), Barrows Neuroscience Institute, Phoenix, AZ; Neuroimmunology Branch (A.N. ), National Institutes of Health, Bethesda, MD; Department of Neurology and Ophthalmology (T.C.F., E.M.F. ), Dell Medical School at the University of Texas at Austin; The National Multiple Sclerosis Society (K.C. ), New York; and Department of Neurology and Program in Immunology (S.S.Z. ), University of California San Francisco. A 57-year-old man with a medical history significant for bipolar disorder, depression, and anxiety presented in 2010 with bilateral lower extremity numbness progressing to perineal numbness and urinary retention. A “working” diagnosis of relapsing-remitting MS (RRMS) was supported by disseminated T2 hyperintensities on MRI investigations of the brain and spinal cord. Furthermore, CSF analysis revealed 4 unique oligoclonal bands not identified in blood. Initial treatment with IM interferon beta-1a exacerbated the patient's depression, prompting discontinuation after only 6 weeks of injection therapy. He was then transitioned to daily subcutaneous glatiramer acetate, which was well tolerated and resulted in disease stabilization for approximately 12 months. He had a relapse in 2011 with symptoms corresponding to a new enhancing lesion in the thoracic spinal cord. The pronounced MS disease burden in the spinal cord, in conjunction with breakthrough disease activity while on glatiramer acetate, prompted the treating team to recommend intensification of disease-modifying therapy with natalizumab, which was administered IV every 4 weeks from 2011 to 2014 for a total of 33 treatments. He had no evidence of disease activity during this time. While on natalizumab, he was monitored for the presence of John Cunningham virus (JCV) antibodies, as it is known that natalizumab treatment in MS confers a high risk to develop progressive multifocal leukoencephalopathy (PML) in patients with a high JCV index. In March 2014, a positive JCV IgG was identified in conjunction with an (elevated) index of 1.77. To mitigate the risk of PML, extended interval dosing (EID) of every ∼6 weeks was instituted, and he received an additional 32 treatments through January 2018 (65 total infusions over the course of 7 years). In mid-January 2018, the patient began exhibiting slurred speech. One week later, he was unable to stand independently. Despite the absence of any new lesions identified on MRI, the likelihood of a new MS exacerbation was considered sufficiently compelling to commence daily treatment with 1,000 mg of IV methylprednisolone for a total of 6 days. Despite the absence of any objective clinical improvement, he was discharged to a rehabilitation center. Subsequently, suspicion of PML prompted urgent transfer to our center for further evaluation. On clinical examination, his mental status and cranial nerve examinations were normal, including intact extraocular eye movements. Motor examination was notable for mild weakness in the right hip and knee flexors, without associated sensory deficits. His reflexes were brisk and symmetric in the upper extremities, 3+ at the right patella and ankle, 2+ throughout the left lower extremity, with an equivocal right flexor, and left plantar response, respectively. He exhibited scanning dysarthria, left greater than right dysdiadochokinesia, and ataxia in both upper and lower extremities. An MRI obtained at admission was notable for a small punctate new enhancing lesion in the right cerebellar white matter (figure, A). The few scattered supratentorial chronic demyelinating lesions did not enhance with contrast. The MRI investigations from his initial assessment in another center were not available to us for comparison. A lumbar puncture revealed opening pressure of 18 mm Hg with zero white or red blood cells in the CSF with protein of 50 mg/dL and glucose of 67 mg/dL. A JCV PCR was sent, but results were not immediately available. Axial fluid-attenuated inversion recovery (FLAIR) image of the posterior fossa (A) from March 2018 showed a new punctate enhancing lesion in the right cerebellar deep white matter (green arrow), which was disproportionate to the clinical cerebellar syndrome. September 2017 axial (B) and sagittal (C) FLAIR images compared with March 2018 axial (D) and sagittal (E) FLAIR images showed interval development of asymmetrical pathologic cerebellar atrophy with widened sulci (yellow arrows). Patchy cortical FLAIR hyperintensities were also observed in the cerebellar folia (purple arrow). (F–H) Coronal post-contrast T1-weighted images of the cerebellar hemisphere performed at 1-month intervals during the 2018 admission showed development of leptomeningeal and parenchymal enhancement (blue arrows) following withdrawal of natalizumab and after plasma exchange treatment suggestive of immune reconstitution inflammatory syndrome (IRIS). Partial resolution of the enhancement was also demonstrated subsequently following steroid therapy. The most salient feature in the patient's presentation, and that which compelled a broad differential diagnostic exploration, was the severe and neurologically disabling cerebellar syndrome, without evidence of concomitant and commensurate neuroradiologic correlates of disease activity. Certain medications may cause cerebellar toxicity, including antiepileptic agents and chemotherapeutic agents. Lithium toxicity is characterized by rapid postural and action tremor, encephalopathy, dysarthria, ataxia, and nystagmus.1 Of relevance was the fact that our patient had been on lithium for decades, although his serum lithium level was normal: 0.8 mmol/L (reference range 0.6–1.2 mmol/L). Deficiencies, including thiamine, B12, vitamin E, or copper (especially in the context of zinc excess), can cause subacute progressive cerebellar ataxias. Our patient had no known predisposing risk factors, and extensive testing failed to demonstrate any evidence of toxicity or of a deficiency state. Infectious causes were broadly considered; in particular, for those with known predilection for affecting the cerebellum or its networks. The patient is not in the typical age group for the development of postinfectious cerebellitis, a condition considerably more common in children and young adults and predominantly in association with varicella, measles, or Epstein-Barr virus infections.2 Brainstem encephalitis with predominant cerebellar signs can be seen with enterovirus A71 and listeria infections. Although these are conditions where CSF and MRI investigations would be expected to commonly reveal signs of inflammation, the concomitant treatment with immunotherapy, especially with those capable of producing immune suppression (including natalizumab), could compromise surveillance mechanisms that usually recognize and neutralize such infectious challenges. Recrudescence of RRMS in the setting of EID was considered, but clinical and radiographic evidence of disease activity can be expected to rebound starting around 12–16 weeks following the cessation of natalizumab treatment,5 whereas our patient was being treated every ∼6 weeks. MRI studies acquired from September 2017 were finally obtained (figure, B and C), revealing significant and asymmetric interval worsening of cerebellar atrophy, as evidenced by the prominent and diffuse widening of the cerebellar sulci (figure, D and E). The fluid-attenuated inversion recovery sequence revealed a patchy hyperintensification, discretely localized to the parenchyma (figure, D and E), and mild restricted diffusion in addition to the punctate enhancement within the right cerebellar deep white matter. Taken together, the interval MRI findings raised the possibility of granule cell neuronopathy (GCN), a JCV infection of the granule cells of the cerebellum. PCR testing (Mayo) of the CSF for JCV returned positive with 3,931 copies/mL (Quest) supporting the diagnosis. The patient subsequently developed horizontal nystagmus with saccadic intrusions and spontaneous intermittent left lower extremity flexing in a pattern suggestive of myoclonus. Natalizumab was discontinued, and he was treated with 3 cycles of plasma exchange. MRI showed evidence of inflammatory reconstitution immune syndrome (IRIS) in the form of new leptomeningeal and parenchymal enhancement in the cerebellar hemispheres (figure, G). The patient was treated with IV methylprednisolone 1,000 mg daily for 3 days after which imaging showed improvement in the pattern of enhancement (figure, H). Intermittent autonomic instability led to posterior reversible encephalopathy syndrome, which improved radiographically, although the patient's mental status declined. Ultimately, he became unresponsive without brainstem reflexes. Sedating medications were weaned with prompt return of abnormal lower extremity movements, although there was no improvement in level of consciousness. Electroencephalography showed no evidence of seizure activity. He underwent a cerebral cortex biopsy to rule out alternative explanations for his level of consciousness including CD8-encephalitis and PML, but the biopsy revealed histologically normal brain tissue. Serial CSF analysis showed 31 copies/mL of JCV by June 2018, but the patient demonstrated no indication of awareness of self or environmental surroundings. He was transitioned to comfort care and died approximately 7 months after symptom onset. Postmortem examination was not performed. Cerebellar granule cell layer pathology in the setting of JCV infection was first described in 1983 in 5% of patients having PML.7 In 1993, large hypochromatic nuclei were described in the granule cell layer of patients with HIV and PML without any evidence of JCV or HIV DNA within those cells.8 However, in 2003, a patient with HIV with PML and cerebellar atrophy was found to have JCV isolated in the granule cell neurons, suggesting that pathologic changes were related to a JCV infection.9 In 2005, a patient with HIV presented with cerebellar syndrome and pathologic findings consistent with GCN without a coexisting PML appearing infection10 revealing GCN as a unique clinical JCV-mediated syndrome distinct from PML. There have been 4 cases of natalizumab-associated GCN published in the literature since 2013.11,–,14 Three patients11,–,13 were treated with plasma exchange (3 or 5 treatments), 2 of whom developed subsequent IRIS. All patients survived with significant morbidity, and the Expanded Disability Status Scale score on follow-up for each of them was 7.0. The fourth patient14 was treated with granulocyte colony-stimulating factor 3 months after her final treatment with natalizumab and is the only patient in this series to improve despite complications from IRIS. Her Expanded Disability Status Scale score was 8.0 at the nadir and improved to 6.5 three months after treatment. Evidence suggests that efficacy of natalizumab is not reduced with interval dosing up to 8 weeks.15 Furthermore, the risk of PML decreases significantly with EID compared with standard dosing intervals in patients with prolonged exposure to natalizumab.16 Although EID may reduce the risk of PML, it does not eliminate it. Furthermore, although there have been cases of EID-associated PML, our case represents the first known case of GCN in a patient on EID of natalizumab. There are no controlled studies or guidelines for treatment of GCN and no antiviral drugs that are effective against JCV. In patients with PML in the setting of natalizumab therapy, plasma exchange is often used to remove the natalizumab, but this treatment is often associated with fulminant CNS inflammation as the immune cells target the PML lesions. Although the immune response is critical for controlling the infection, the inflammation (i.e., IRIS) can damage the surrounding brain parenchyma. To prevent the damage caused by inflammation, corticosteroids are used to temper the immune response, albeit protracted regimens may be necessary to control the process of IRIS (table). 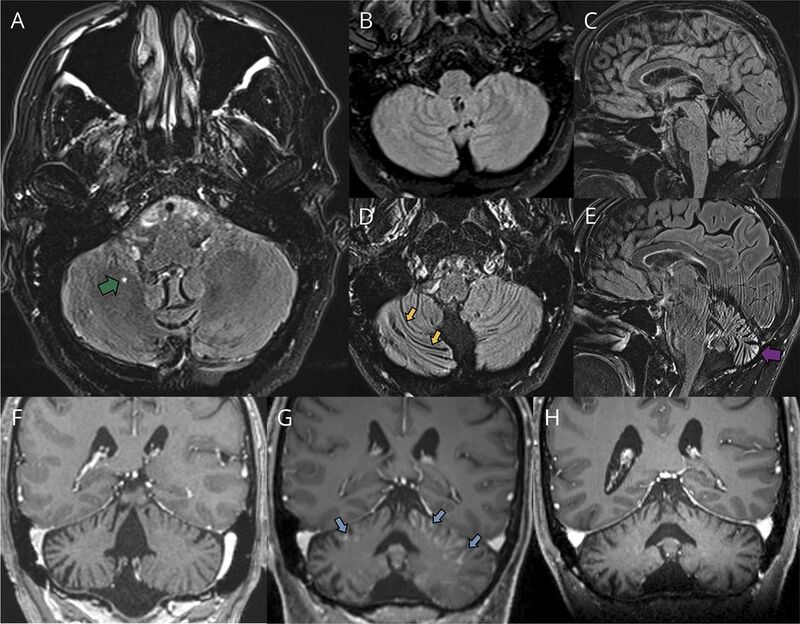 This case illustrates the challenges posed in the diagnosis and management of patients with PML in general and for the GCN variant in particular. D.A. Lapides, P.P. Batchala, and J.H. Donahue: conception, manuscript drafting, clinical and imaging review, literature review, and critical revision of the manuscript. R.P. Lisak, E.I. Meltzer, R.N. Narayan, and A. Nath: critical revision of the manuscript. T.C. Frohman: critical revision, rewriting, and further revision of the final versions of the manuscript. K. Costello: critical revision of the manuscript. M.D. Goldman: conception, manuscript drafting, clinical and imaging review, literature review, critical revision of the manuscript, and mentor to D.A. Lapides (MS Fellow). S.S. Zamvil: critical revision, rewriting, and reorganization and final revisions of the manuscript, and co-titling of the paper with T.C. Frohman. E.M. Frohman: critical revision, rewriting, and reorganization and final revisions of the manuscript, conception of table, and co-titling of the paper with Dr. Zamvil. Diagnostic and Treatment Challenges in MS and Neuroimmunology Webinars is sponsored by the National Multiple Sclerosis Fellowship Training Program. D.A. Lapides consulted for Board Vitals and received research support from the NMSS. P. Batchala and J.H. Donahue report no disclosures. R.P. Lisak served on the scientific advisory boards of Syntimmune, Alexion, Argenx, Novartis, NMSS Michigan Chapter Myasthenia Gravis Foundation of America, and Guillain-Barre Syndrome/CIDP Foundation International's Medical Advisory Committee; received speaker honoraria from Teva; served as section editor of Neuroimmunology and Clinical Neuropharmacology; served on the editorial board of Immunology Research; received publishing royalties from Blackwell and Oxford; consulted for GLG Consulting, Insight Consulting, AlphaSites Consulting, Slingshot Consulting, and Informa Pharma Consulting bioStrategies Group; served on the speakers' bureau of Teva; is chair of the clinical advisory committee of the NMSS, board of governors, research grants committee and Centers of Excellence Committee of the Medical Advisory Committee of the GBS/CIDP Foundation, and Grants Committee of the Myasthenia Gravis Foundation of America; and received research support from Teva, Alexion, Genentech, Novartis, Medimmune, Chugai Ra, and Argenex paid to Wayne State University for participation in clinical trials MedDay as chair of adjudication committee. E.I. Meltzer and R.N. Narayan report no disclosures. A. Nath served as associate editor of the Journal of Neurovirology, editor of Practice Neurology, section editor of Frontiers in Neurology, and co-chief editor of Current HIV Research and received research support from GeNeuro and NIH. T.C. Frohman received travel funding and/or speaker honoraria from Novartis, Acorda, and Genzyme; served on the editorial board of NMSS publication; received publishing royalties from Up To Date; consulted for Acorda, Novartis, and Genzyme; and served on the speakers' bureau of Acorda, Novartis, Genzyme Biogen, and NIH. K.M. Costello received travel funding and/or speaker honoraria from Advanced Studies in Medicine, Johns Hopkins Medicine, and Baptist Health. M. Goldman served on the scientific advisory boards of Acorda and PCORI; received travel funding from Novartis and Teva; is associate editor of SAGE Open Medical Case Reports; consulted for Adamas, Celgene, ENDECE, EMD Serono, Novartis, Sanofi Genzyme, and Teva; and received research support from Biogen, Novartis, NMSS, and PCORI. S.S. Zamvil served on data safety monitoring boards of Opexa, BioMS, Teva, and Eli Lilly; is a member of the clinical advisory board of the Myelin Repair Foundation; received speaker honoraria from Biogen and Teva; is deputy editor of Neurology® Neuroimmunology & Neuroinflammation; consulted for Biogen, Teva, EMD Serono, Genzyme, Novartis, and Roche; serves on the speaker's bureau of Advanced Health Media and Biogen; and received research support from Biogen, Teva, NIH, NMSS, the Weill Institute, and Alexander M. and June L. Maisin Foundation. E.M. Frohman received speaker honoraria from Genzyme, Novarits, and Acorda; served on the editorial board of Journal of Neurology, Journal of Neurology, Neurosurgery, and Psychiatry; receives publishing royalties from Up To Date and Cambridge University Press; served on the speaker's bureau of Genzyme, Novartis, and Acorda; and received research support from the National MS Society. Disclosures available: Neurology.org/NN. The National Multiple Sclerosis Society Case Conference Proceedings is both a live educational Webinar, in conjunction with a peer review publishing initiative from the monthly. “Diagnostic and Treatment Challenges in MS and Neuroimmunology Webinars” is sponsored by the National Multiple Sclerosis Society Fellowship Training Program and directed by Elliot M. Frohman, MD, PhD, and Teresa C. Frohman, MPAS, MSCS, PA-C, from the Dell Medical School at the University of Texas at Austin. ↵* National Multiple Sclerosis Society Case Conference Proceedings Faculty. ↵† Guest Editors-in-Chief: Elliot M Frohman, MD, PhD, and Scott S. Zamvil, MD, PhD. ↵‡ Guest Managing Editors: Kathy Costello, MS, ANP-BC and Teresa Frohman, MPAS, PA-C, FANA. ↵§ Guest Assistant Editor: Ethan Meltzer, MD. The Article Processing Charge was funded by National Multiple Sclerosis Society. Accepted in final form January 11, 2019.
. Permanent lithium-induced cerebellar toxicity: three cases and review of literature. Mov Disord 2007;22:570–573.
. Case records of the Massachusetts General Hospital. Case 30-2013. A 19-year-old man with otalgia, slurred speech, and ataxia. N Engl J Med 2013;369:1253–1261.
. Paraneoplastic cerebellar degeneration with anti-Yo antibodies—a review. Ann Clin Transl Neurol 2016;3:655–663.
. Cerebellar ataxia with glutamic acid decarboxylase autoantibodies. Neurology 1999;52:857–859.
. Natalizumab drug holiday in multiple sclerosis: poorly tolerated. Ann Neurol 2010;68:392–395.
. Risk of natalizumab-associated progressive multifocal leukoencephalopathy in patients with multiple sclerosis: a retrospective analysis of data from four clinical studies. Lancet Neurol 2017;16:925–933.
. Progressive multifocal leukoencephalopathy: its pathological features. Prog Clin Biol Res 1983;105:191–203.
. Cellular changes in the cerebellar granular layer in AIDS-associated PML. Neuropathol Appl Neurobiol 1993;19:398–401.
. Productive infection of cerebellar granule cell neurons by JC virus in an HIV+ individual. Neurology 2003;61:775–782.
. JC virus granule cell neuronopathy: A novel clinical syndrome distinct from progressive multifocal leukoencephalopathy. Ann Neurol 2005;57:576–580.
. JC virus granule cell neuronopathy and GCN-IRIS under natalizumab treatment. Ann Neurol 2013;74:622–626.
. JCV GCN in a natalizumab-treated MS patient is associated with mutations of the VP1 capsid gene. Neurology 2014;83:727–732.
. John Cunningham Virus–induced cerebellar granular cell neuronopathy in a patient with MS treated with natalizumab. Neurographics 2016;6:369–371.
. Natalizumab granule cell neuronopathy: FDG-PET in diagnosis and immune reconstitution with G-CSF. Neurol Neuroimmunol Neuroinflamm 2017;4:e384. doi: 10.1212/NXI.0000000000000384.
. Extended interval dosing of natalizumab in multiple sclerosis. J Neurol Neurosurg Psychiatry 2016;87:885–889.
. Natalizumab Extended Interval Dosing Is Associated With a Reduction in Progressive Multifocal Leukoencephalopathy Risk in the TOUCH® Registry. San Diego: ACTRIMS; 2018.